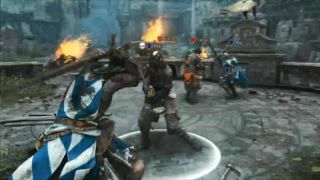 For Honor is a four-on-four melee battle game in which players square off in brutal combat as a Knight, a Viking, or a Samurai, each with their own unique weapons and play styles. One of the hardest things to get right in any game featuring melee combat is reproducing the feeling of swinging a heavy steel weapon, burying it in some poor chump's skull, and then pulling it out. Creative Director Jason VandenBerghe said during the presentation at Ubisoft's E3 press event that For Honor is built around "The Art of Battle," a new kind of control system that will let players "feel the weight of the weapon in your hand." The For Honor YouTube page describes the game as "a fast-paced, competitive experience mixing skill, strategy, and team play," with teams battling over control points, but a four-on-four demonstration on the E3 stage seemed a lot more focused on clobbering one another than on holding together any kind of strategy. Which isn't necessarily a bad thing, and sometimes, hitting lots of guys in the head with an axe is all the strategy you need. There was no mention of a possible release date, but for now you can find out more at the For Honor Facebook page.